Let’s face it: while a lot of people are debating whether they’re a cat person or a dog person, for some of us the argument is more if were a snake person or a hedgehog person. Cats and dogs get all the glory, but in the world of animal companionship, they’re hardly the only game in town. When it gets to the wacky or weird, how do you know what pet is best for you? What are the pros and cons of something outside the box? On the scale of effort required, puppies can factor somewhere between cats and toddlers. That’s a lot of work — way more than some people are prepared (or able) to put into their pet. The level of maintenance required will depend on the specific pet. Exotic pets like snakes only need to be fed around once a week. That said, you can’t pop out to your local grocery store for snake feed. Birds, meanwhile, are cheap to feed, and their food can be found anywhere. Animals can be more than companionship — they can be a beautiful addition to your home. Many terrariums and cages for snakes or reptiles can look beautiful. Bird cages range from functional to beautiful. Fish tanks often serve as a decorative addition to any home. Fish tanks can also act as a calming presence to those with anxiety and can even generally reduce stress. Dogs and cats don’t have the market cornered on playtime. Animals all play in their own way. Ferrets can be incredibly playful, as can fennec foxes. Smaller animals, like rabbits, hamsters, hedgehogs and mice, are playful in their own way. Birds are smart and can use that intelligence to get up to fun. There’s a lot of great stuff to be said about ferrets. They’re silly creatures, very affectionate and entertaining to watch. They’re also smelly. 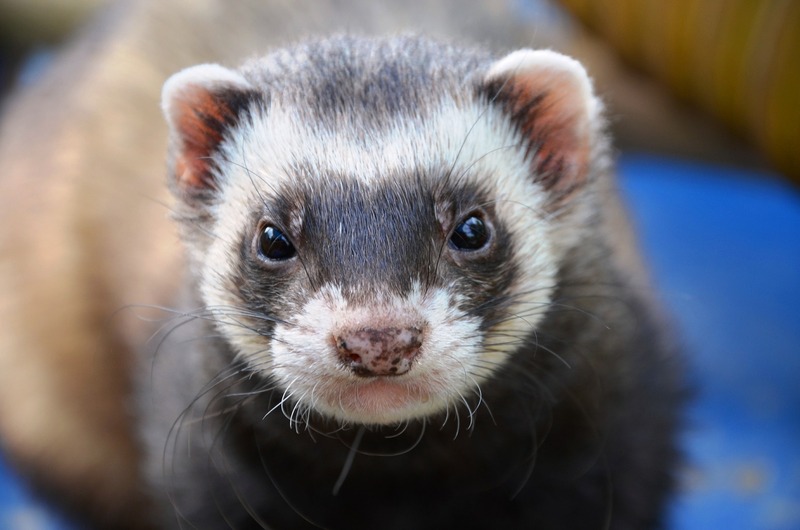 Ferret smell can be managed, but it takes a lot of work, including daily cage cleaning and frequent baths. Birds like parrots can be taught to talk to you, but you have to be careful about the things you say around them, as well as other noises you make. Some people don’t like their birds to whistle, which means implementing a whistle-free zone around your bird. Not all exotic animals are legal to own everywhere. While it’s no big surprise that you can’t legally own a tiger as a giant house cat in most places, it might surprise you that ferrets are illegal in Hawaii and California. You can own a fennec fox in New York, but you can’t own a raccoon in Idaho. Venomous snakes are illegal in many states, such as New York, Delaware, Vermont, and Louisiana. Some exotic pets require permits to own, such as sugar gliders in Pennsylvania. As with any other aspect of caring for an unusual pet, make sure you check out the legality of your chosen pet in your state! Because exotic pets aren’t as ingrained in our collective consciousness as dogs and cats, there’s not as much general knowledge out there. It’s important for those looking to acquire something out of the norm to love and care for to do extensive research, so you know not to leave your remote controls around ferrets or keep your rabbit caged all day. Not every vet will see an exotic animal, so it’s also important to make sure your chosen vet is okay with whatever exotic animal you choose. A little research goes a long way towards making sure your pet will live a long, happy life as your companion. Brooke Faulkner is an animal advocate and mother of two. When she's not writing, she can usually be found zipping around on her ATV. She first fell in love with animals as a young girl, on a family visit to a goat farm in New Hampshire. She's dreamed of adopting a Great Pyrenees ever since. To read more of her words, follow @faulknercreek.